Delivering MORE Than Just Great Pizza! NO ROYALTIES! We offer a flat fee of $1,500. per month for the entire contract period (1,000/m the first 3 months as you ramp up revenue). Totally unique in the franchise industry. At Happy's Pizza, we are "Delivering More Than Just Great Pizza"™. While offering a variety of fresh meal options including barbeque ribs, delicious salad and Happy Wings®, Happy's Pizza only uses the finest ingredients 100% mozzarella cheese, fresh meats and vegetables and everything is made fresh to order. While delivering thousands of meals each day from our beautifully designed iconic stores, our customers remember to Eat Happy's, be Happy! The food is amazing and the prices are unbeatable! Our pizza is second to none, but our incredibly diverse menu featuring smoked ribs, barbecued chicken and seafood sets us apart. Restaurant franchising is a $60 billion a year industry and pizza accounts for one half of all Quick Service restaurant sales. Add to that, ribs, chicken and seafood and we've got something for everyone in the family any day of the week. While each of our stores undergoes Happy's classic build out, operators gain admission to The University of Happy's Pizza. After 7 days of training in our corporate kitchen, we then provide 14 days of in-store management training at your Opening Week (pre and post opening period). Once a store is open, our support staff helps you with marketing, inventory control, staffing, prep and food updates. At Happy's Pizza we are proud to provide our franchisees with a variety of support including site selection, lease negotiations assistance, equipment, fixture, signage and inventory suppliers and even construction standards and assistance. In addition to this, once a new store begins operations, Happy's Pizza provides all stores with an operations manual, continuous updates of our specifications and process and operational advice and assistance by telephone and Internet. We are one of the only restaurants with a toll-free vanity number and we know how to use it. 800 BE HAPPY. Our in-house ad agency will customize individual marketing plans for every store. It starts with coming soon banners, job fairs and a big grand opening push. Once operations are running smoothly, we turn up the marketing machine with TV. Radio, direct mail, mobile and on-line promotions connected with our growing social web presence. 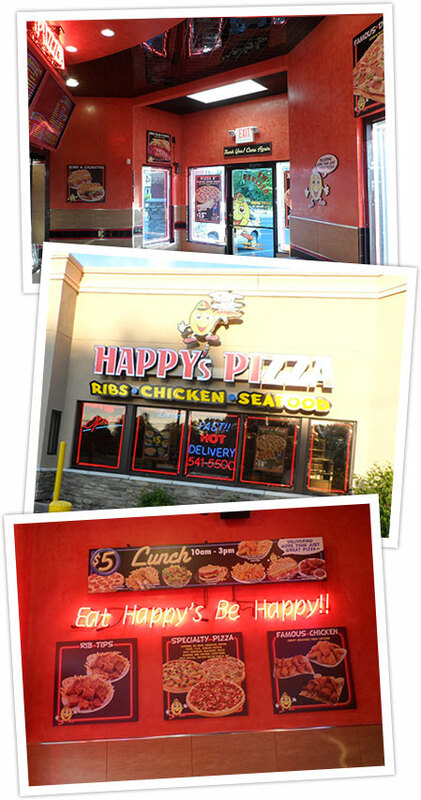 Our classic Happy's Pizza restaurant design has become an icon throughout the Midwest. Happy's prototypical exterior conveys an image of quality and consistency. Decorated in granite, ceramic tile and neon, the interior works hard to extend the brand. Our construction department assists with floor plans, site elevations, sign and kitchen equipment packages. Conversion: This option converts an existing building into a new Happy's Pizza location. End Cap: An end cap store is one typically found at the end of a strip mall. Some feature drive up carry out windows. In Line: This style is perfectly placed amongst other stores in a retail plaza. Single Use: A standalone building is one in which the Happy's Pizza Restaurant is the only business at the property. These are always either conversions or ground up developments. When we're not smoking ribs, we're smoking out new locations. Our size and reputation gives new owners instant leverage in real estate negotiations and financing. Our team of savvy store scouts analyze all the element for success such as population density, traffic flow and demographics. Thinking About Building Your Own Happy's Pizza Franchise? Fill Out The Form Below And A Franchising Specialist Will Contact You With More Information On How To Get Started! Looking for more information about Happy's Pizza? Take a moment to fill out our quick information request form.